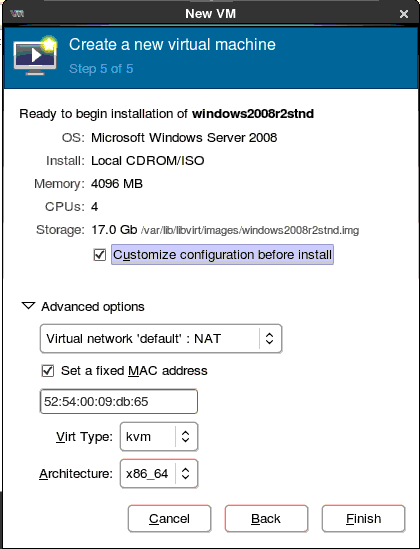 Step 1: Ensure yourself to stopped the NC service on the server/System on which, where you are going to create new Windows 2008 Imaging. Create a Newfolder under /root directory and copy the required software window2K8 iso image, virtio driver and Eucalyptus windows Image Integration tool to that Newfolder. Step 2: Make sure that you have all the required package have been installed on NC machine to run virt-manager. 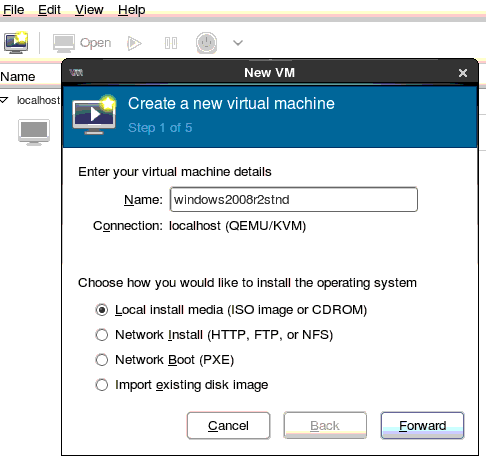 To setup this refer this blog Single-Steps-to-install-virtual-machine-manager-On-Linux-Machine. and Launch the virt-manger console from Linux GUI session. Step 4: Click on browse and locate the Windows ISO image. 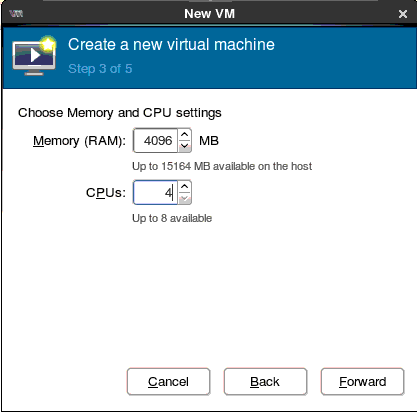 Step 5: Change the CPU and RAM values as per your availability. I suggest you to have at-least 8GB RAM of your Physical Machine and choose 4GB RAM to start Install. 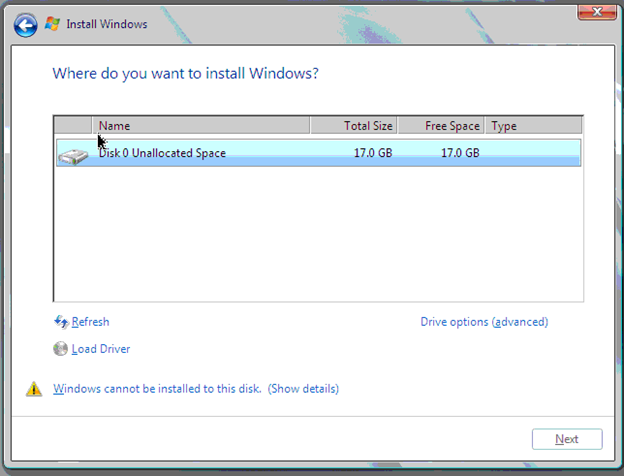 Step 6: The minimum Hard disk size required for Windows 2K8 image is 17 GB. Step 7: Please check the box " Customize configuration before install" and do not change any settings in "Advanced options" and by default it's be an "NAT". 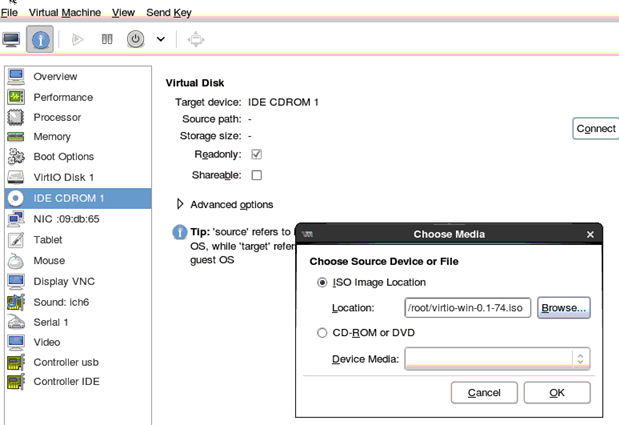 Step 8 Click on the disk option shown on left pane and change the "Disk bus" option to "Virtio" on right hand side window and apply the settings. Please see the below shown image for reference. 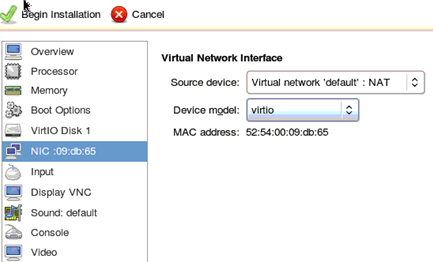 Step 9: Click on the NIC option in the left pane and change the "Device model" option to "Virtio" and don't forget to Apply the settings at the bottom. 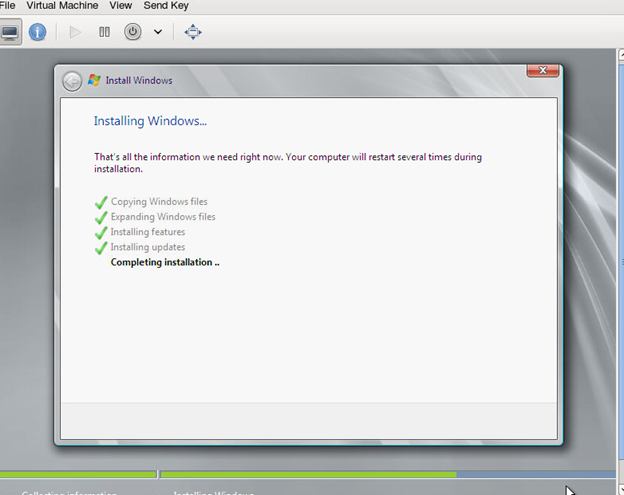 Step 10: Click on "Begin Installation". 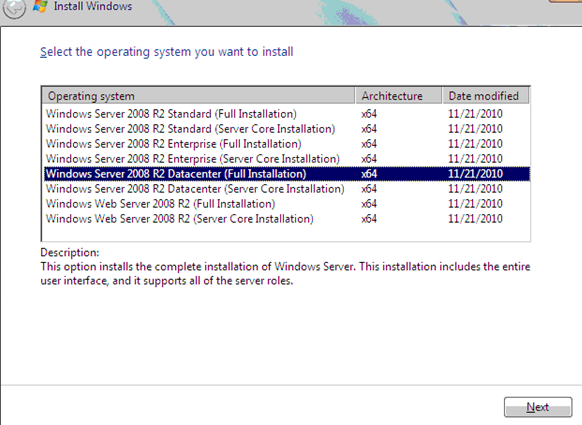 Now the windows 2K8 installation process starts. I hope you know basics on how to install windows OS in a your machine/server similar way you continue the OS installation and provide required information. Step 10: Do not get panic, If you do not see Hard disk drive while performing OS installation. 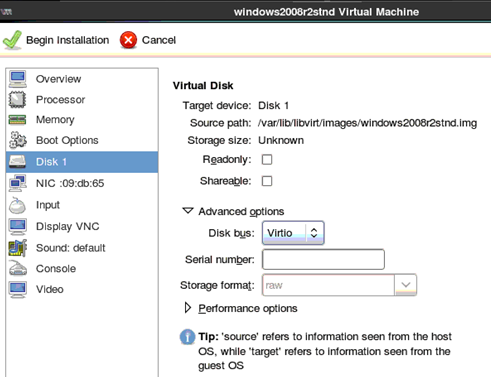 You need to install virtio drivers during the OS installation in order to recognize Virtio HDD in OS. Step 11:Now click on the VM (Virtual Manager) details option looks (small icon with "i" symbol) on top---> select "IDE CDROM"---> click disconnect option on the right hand side ---> again click connect option --> ones pop up window would display ----> locate the Virtio drives copied in you OS (/root/folder). Step 11: Now go to your windows installation screen and click "browse" option shown at the bottom and click on "CD ROM "--->expand the CD----> select Win7 so the same refer below image. 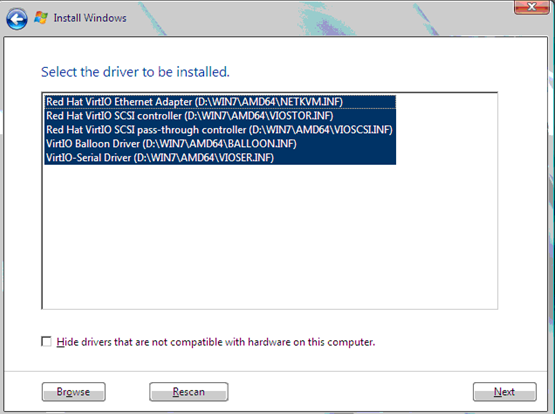 Step 12: Uncheck the box "Hide drivers that are not compatible with hardware on this computer" and select all drivers by holding the control key on the keyboard --- >click on Next. 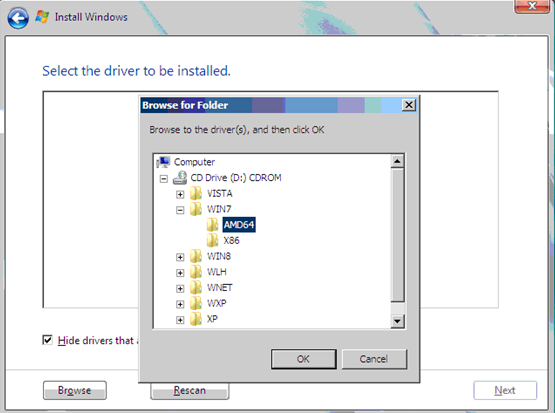 Step 13: Once the drivers installation is over and then go back to VM details option "(small "i" icon) and select ---> CD ROM----> click disconnect and again click connect -----> locate your OS of windows ISO image. 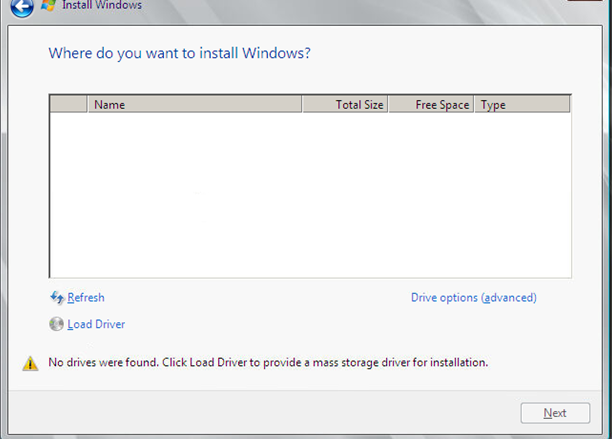 Now come back to same window ( HDD widnow) and click on refresh option. Then select the HDD and click on next. 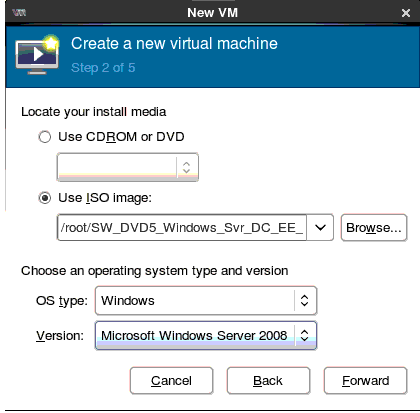 Step 14 :Log into your windows VM with new password which you have changed on the first login. 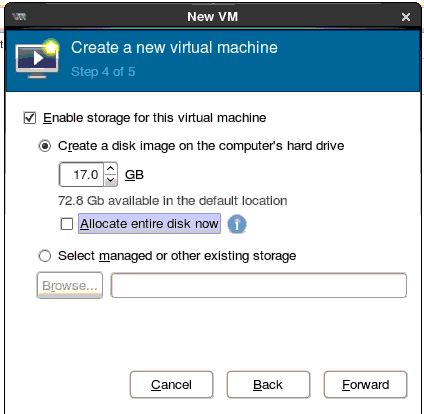 Step 15: Now click on the VM details option (" small "i" icon) on top, and go to CDROM and locate your Eucalyptus windows integration ISO image. To do this step, Again I'm guide on my next blog, please refer here Windows IMG file Creation for create a windows Image and its Instance in Eucalyptus. i am in my progress to do the LAN storage..
do you have any idea about it..? could anybody name a several so that i can try to install? do you have a tutorial about eucalyptus' installation? I hope It will Help You!... If u facing any issues Let Me know? For Further Comment we will discuss under on above links Comment option. If Above Link Doesn't Works Means... Please use this links to start Install the Eucalyptus.